SDSU Resource Fair: 5 - 6:30 p.m.
Get connected at this local SDSU Resource Fair and enjoy FREE* gospel music featuring choirs from throughout San Diego. This experience showcases the bond between SDSU and the San Diego community. Concert to follow the resource fair. *Tickets required (limited seating) - visit the Conrad Prebys Aztec Student Union ticket office for tickets. Note that this listing is not exhaustive. Academic departments, divisions, programs, and other SDSU organizations may produce newsletters and event calendars not listed here. 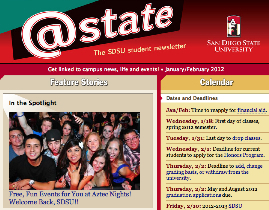 Students stay linked to campus news, life and events through the @State e-newsletter. Watch SDSU on YouTube, friend SDSU on Facebook, follow SDSU on Twitter and Tumblr, read SDSU blogs — and connect with SDSU's online communities!